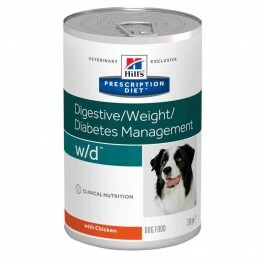 Hill's Prescription Diet w/d Canine is a complete and balanced food that provides all the nutrition your dog needs. It is recommended for weight maintenance after weight loss, fibre-responsive conditions (diabetes mellitus, hyperlipidaemia, colitis and constipation), hyperlipidaemia and struvite urolithiasis reduction in obesity prone dogs. Hill's Prescription Diet w/d Canine is also appropriate for adult dogs that are less active or neutered. 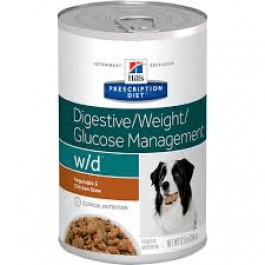 Hill's Prescription Diet w/d Canine should be recommended by your veterinary surgeon. For detailed information on feeding amounts and how this food can help your pet, please consult your veterinary surgeon. Exclusively feed the recommended Prescription Diet food and keep fresh water available at all times. These ranges are a starting point only because dogs' needs vary. Adjust the feeding amount to maintain the optimal body weight.